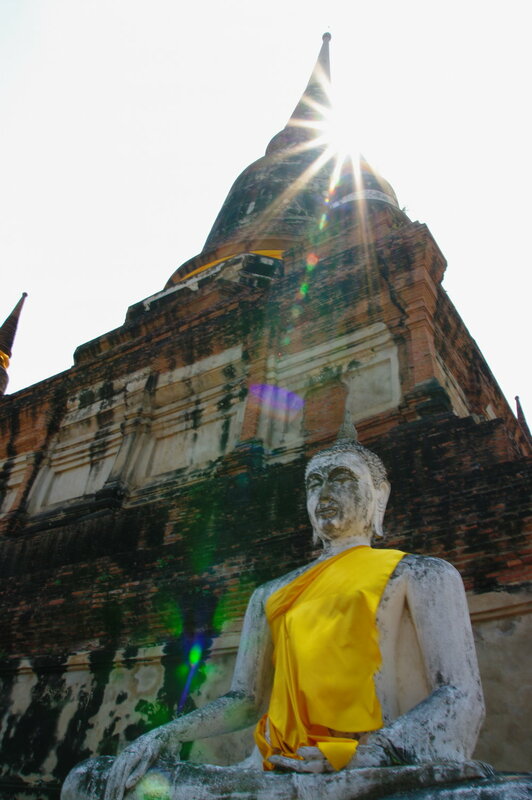 Last weekend, we finally managed to get to Ayutthaya. It wasn't quite what I expected; the whole city is a UNESCO heritage site, so I expected a large area of ruins, but the city itself has grown up around it (in fact, it's hard to tell where Bangkok ends and Ayutthaya begins) so the ruins are surrounded by surburban life. Most of the ruins and temples you can see are walled off, and have a small fee to enter, but there is little evidence that this fee goes to protect or upkeep the sites. In fact at the offcial "City of Ayutthaya Park", which is a small section of ruins walled off, there is a market and hawkers which go right up to the gate - an awful experience (especially since the market is just full of cheap souvenirs and food that tourists couldn't eat.) The heat was also agony - but we did arrive at 2 in the afternoon! The best experience, by far, was at Wat Yai Chai Mongkol, where I managed to get some photos which are traditional enough to make me feel less guilty about not exploring much of Thailand! Amanda Palmer Suggests a New Kind of Artistic Economy.